We met Mr. Kandinsky this week. Mr. Kandinsky was a man who decided to listen to the music of his heart (like Gerald in Giraffes Can't Dance) and become a painter instead of a lawyer. When he first started painting, he mostly painted pictures of landscapes, but later moved to paintings of line, shape and colour. He is credited with painting the first purely abstract picture. Patty at Deep Space Sparkle (bless this woman for sharing her ideas and expertise) posted a non-painting version of Mr. Kandinsky's Farbstudie. Fit the bill perfectly. Thank you Patty. We looked at Mr Kandinsky's painting. We saw that he used lots of different colours. We saw that his circles weren't "perfect" - that worked for us. We saw that they were all different. 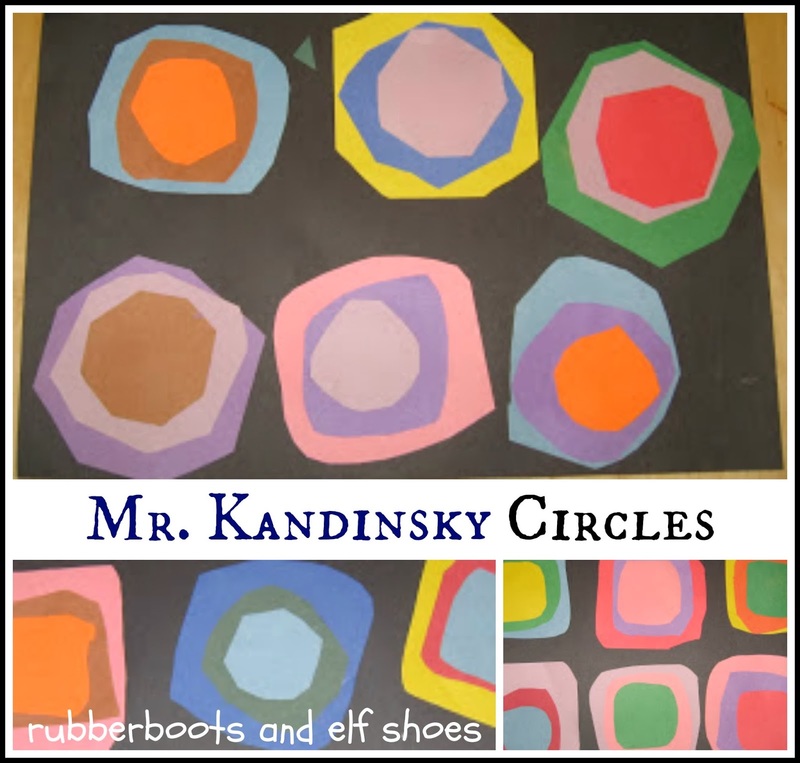 We decided (with subtle teacher direction) that we would make 6 circles in our Mr Kandinsky art, and that each circle would have 3 "layers". I had precut (the reason the subtle teacher direction was necessary) squares in 3 different sizes - 3 inches, 4 inches and 5 inches. The kidlets chose one of each size (it fit in well since we have been reading various versions of Goldilocks and the Three Bears at lunch time - we had a Papa square, a Mama square and a little wee Baby Square). 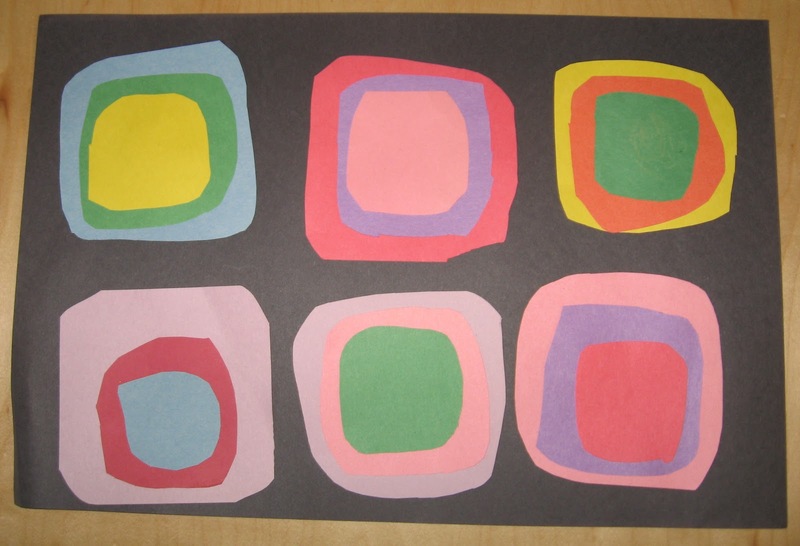 Usually when transform squares into circles, we cut "curvy corners" tlc style, but this time I encouraged them to cut the sides as well, so that our circles were more like Mr. Kandinsky's. I wanted to chat with the kids about warm and cool colours; that was part of the plan. But we did not have enough time. We talked instead about bright and soft colours. When choosing their three colours, the kidlets had to decide whether they wanted bright colours, or soft colours, or both. Some of the kidlets picked primarily their favourite colours, but some very very thoughtful and deliberate in their colour choices and created some very striking combinations. 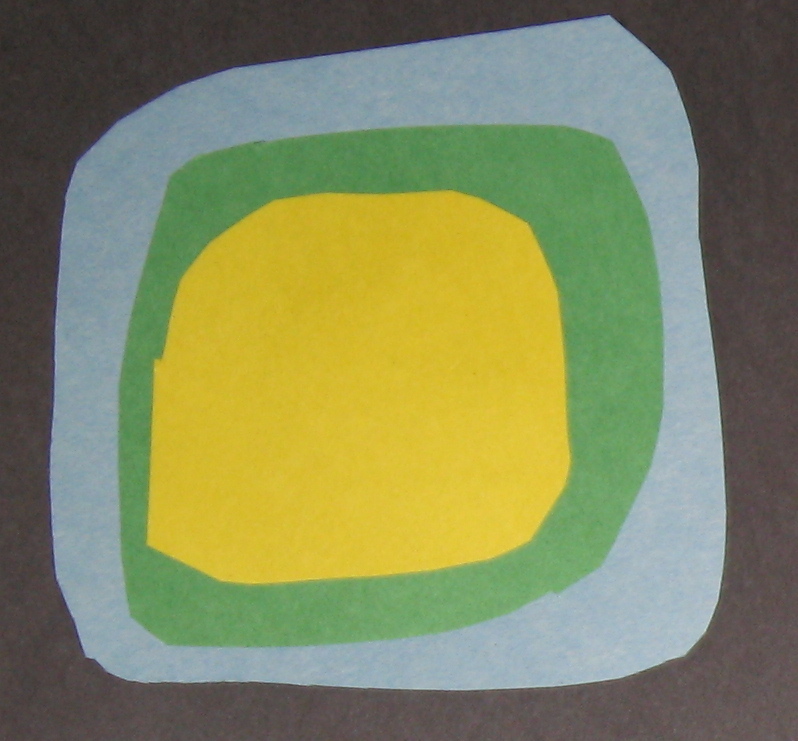 When the wee artist showed me this circle, she said that she had the "whole world in her hands" - the sun, the grass and the water. I loved the way that she approached her creating. When the kidlets had created 6 Mr. Kandinsky circles, they were ready to glue them onto the background. I encouraged them to play with the circles until they looked "just right". I have the privilege of working with artists. 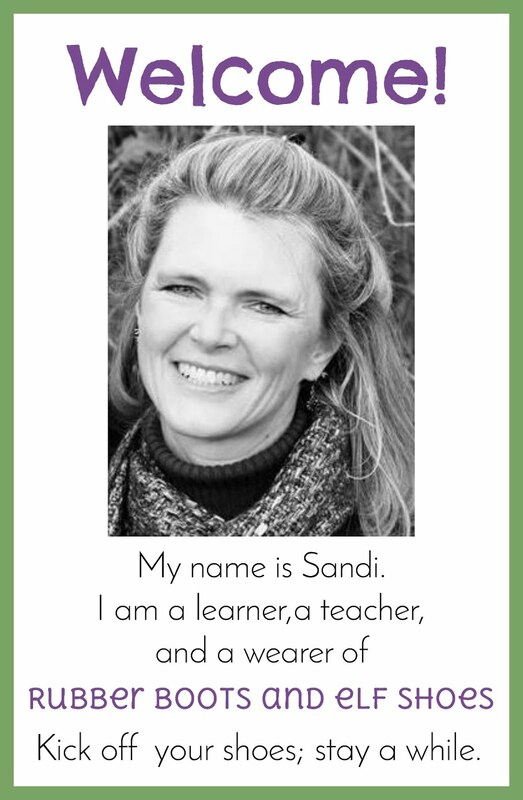 I am so happy you found my blog and sent me to yours! I love it! I can't wait to see more of your ideas. That is too cute! I love this idea! I may have to try it with my kids. I'm so glad you found my blog too! 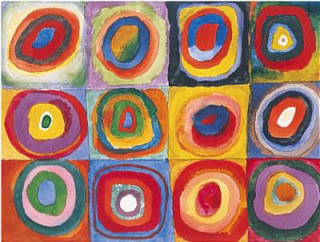 I LOVE Kandinsky circles, we usually do this right before learning to layer paint while looking at Van Gogh's Sunflowers. Anywho, keep up the great work, you've got a new follower! 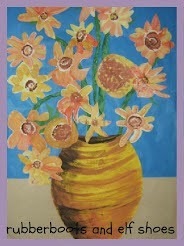 Miss Jessie - I did Van Gogh sunflowers with my kids for the first time in September. They were incredible. 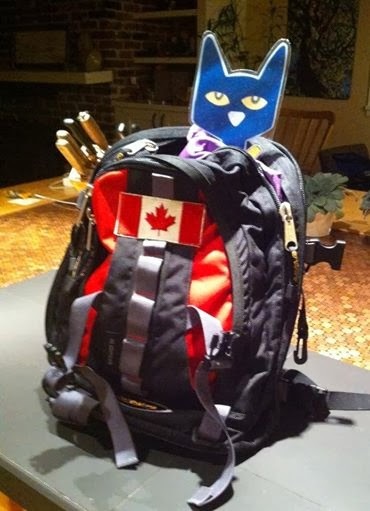 Kids' art blows me away!